Want some more? There’s still some time to go before the 2014 general elections and that time period might add to the list above. We are lucky! We are more civil now than Benjamin Disraeli (19th century British PM) who, when asked to differentiate a misfortune and calamity, referred to his rival and explained “If Mr. Gladstone were to fall into the Thames, it would be a misfortune. But if someone dragged him out, it would be a calamity”. I could say the same about a scumbag like Rajdeep Sardesai but there’s one difference. If Rajdeep were to fall into the already-polluted Yamuna that wouldn’t be a misfortune but if someone dragged him out, that would be a calamity. Such is the hatemonger’s hypocrisy that the only thing that stands out it in any of his dialogues is utter contempt for truth. He’s not alone; his partner in the Mom & Pop stores called CNN-IBN, Sagarika contributes her share of filth in the discourse. Both these wilful morons insult people’s intelligence and act as brokers and campaigners for political parties. Their latest has been as active campaigners and promoters of the AAP party. Many had suspected the entire IBN group was rooting for this party and my previous post ‘AAP-Sucker Proxies’ also deals with this. Here’s IBTL (a news website) further explaining how tweets were constantly exchanged and relayed between the IBN group members and AAP members to promote the party. The texts under the red circles may not be quite legible so I suggest you look up the Tweet and enlarge the image to read. It is not just that Rajdeep often peddles garbage; he often promotes those who peddle garbage to suit his political agenda. Having a bias or political is not a crime. If a media house wants to promote a certain party or political ideology it would be honourable if they said it upfront instead of claiming to be ‘neutral’. Forget the neutral part, when do media crooks need to repeatedly assert who they are unless their conscience keeps hurting? Why else would this comic duo have to send out messages like these? We are journalists! We are journalists! Don’t shoot us! Even Manmohan Singh never asserts being the PM so much, even though technically he is one. So from a “Vision of India” Rajdeep turned it into how politicians slander each other. Talk about a hatemonger sermonising the world. Another guy from the HT warehouse jumps in to say politicians don’t like “neutral” stands. Sure, HT and its foot-soldiers must know what neutral is all about. Err.. Licking both feet of Madamji equally would be neutral? And what is the problem? That Modi called Pappu a Shehzada. So Rajdeep probably wants to keep political discourse as close to the holy Quran or Bible as possible. Diggy says he never called Modi “Bhasmasur”. Fair enough! He calls people “thugs” and endorses “26/11 RSS ki Saazish” and “RSS bomb making factories”. I guess those don’t fall into the “slander” category. I opened this post with all the choice epithets that the Congress and MSM have hurled at Modi and Rajdeep, the former Congress politician and now the AAP-Sucker, wants clean discussions. 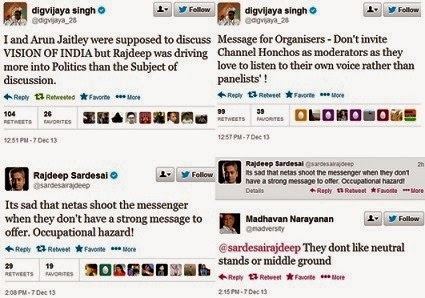 Even Diggy calls Rajdeep a part of politics in the end. What a rise! What exactly is so offensive about Shehzada? After all, it’s just an Urdu word for Prince. Isn’t it? But as Sunetra Chaudhary points out in her profound article, it is okay to abuse in English but the same thing wouldn’t pass if it were in a local Indian language (Why desi netas willnever charm the English media). So you see, the English Laloos can get away but the desi ones have to pay a price if they call someone “Shehzada”. Hypocrite Rajdeep knows that too. Hero of hatred? Mass murderer? That is not as offensive and slanderous as Shehzada I suppose. And this is being said in front of a select audience to deliberately insult a Chief Guest and keynote speaker. This is the culture Rajdeep wants to pass on to his son? Did the son watch that video with the pathetic slandering by dad? As Digvijaya inconveniently pointed out in HT 2013, the same happened in HT 2007 as well. In 2007 the topic for that day was “Centre-State relations”. What does Rajdeep do? He turns it into a tirade on Gujarat 2002, discrimination against Muslims, hero of hatred, mass murderer, blah blah. I sincerely believe this editorialist would pollute the Yamuna if he were thrown in it. That is the level to which he has degraded journalism and public discourse. And that HT sidekick thinks people don’t like neutral stands. Who are these people trying to fool? 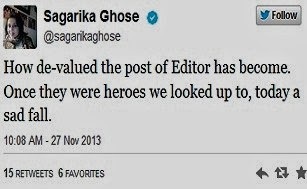 Post the Tejpal episode Sagarika Ghose laments how editors have been “de-valued”. I don’t call these people “editors”; they are unworthy of that title. They are “editorialists” whose job is to swing opinion one way or another. Let’s see, they have no problems in welcoming a spokie who indulged in sexcapades in his office with certain promises. Morals! They still invite a person who admits he talks rubbish and 50% of news channel content is a joke. Morals! 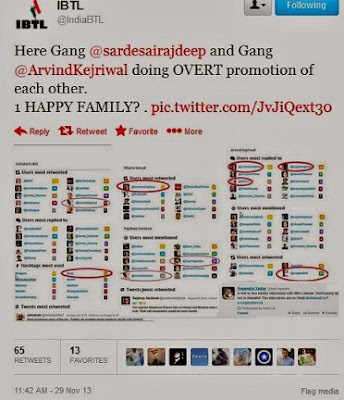 Rajdeep defended Radia-tainted media celebs and even tried to get in Vir Sanghvi through the backdoor into debates. The list can get longer if put under a search. Both he and Sagarika call politicians and people names at their will and demand public discourse is clean. They say "charity begins at home". 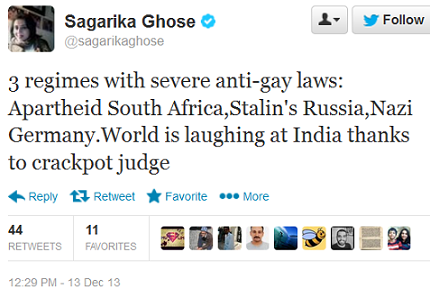 The woman who abuses Indian males as ugly, calls ordinary people guttersnipe, ridicules court judgements has now heaped the ultimate insult and slander on the Indian judiciary. Rajdeep talks about his son being concerned about slander in politics. A small mirror on the streets of Delhi just costs around Rs.25. Rajdeep would do well to keep one in his pocket all the time. Hatemongers shouldn’t be sermonising others so often. Today is Friday 13 Dec. ? You normally post in the morning...what happened? Couldn't wait to fire another salvo? I checked just by chance and found the update...had given up on today otherwise. Commies like RS and SG have no respect for anybody.They think they are supreme and can balber whatever they want. 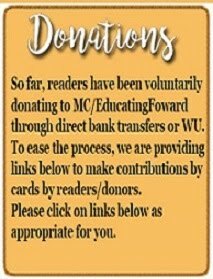 Great work Ravinarin, please keep up the good work. One day you will acheichive what common people are not understanding. Great work sir I dont think there is anything which I came across on internet. I love your posts and keep waiting to look for the next one. current day journalists if they do even do 5 % if what Ravi does India would have been different. hehehehehehe...I had not noticed until you pointed it out! Once again you have successfully brought out the moronery followed by scumbag and scumbagini. Can the abuse of neutrality be not taken to the doors of Press Council of India or such forum where the issues about neutrality can be effectively dealt with? The electorate is wiser day by day even after such biased behaviours of MSM and voting according to its intuition and insight. really? Do you know who is the Chairman of Press council of India? Congrats for a beautiful piece..Absolutely lethal and brilliant..
Numero Uno, Numero Unee and now Numero Sonny! Dear Chacha : You forgot Numero Sonny ! Ravinar....a big thank you for writing this article! How dare she call SC Judge as a "crackpot". Does she think judiciary as her editorial office. Cant the SC take suo moto case and sue this retard sagarika. If the SC cannot take suo moto cognizance on this remark, then they deserve to be one..!! Called SC Judge a "crackpot"?? Indicted in CAG report in CWG scam- no action;Proximity to Niira Radia- No fuss;Dubious role in Cash-for-votes scandal-No problem and now calling a SC Judge a crackpot-nobody is protesting. This is the support base of the most honest person on the earth Shri Kejriwal, who the media portrays as the updated version of Mahatma Gandhi. On the other hand Saint Kejri too don't see anything wrong in taking their support. Ravinar, a masterpiece / stroke. I think in one of your twieets you did mention about Friday the 13th,. Is this the one. You have completely stripped these unworthy so called journalists. May God Bless you and give long life. stripping off does not pass much message...for them only perfect "Chamaat" makes some difference...today it is Friday the 13th ..so he gave them the horror with a mirror!! shouldn't she be charged for contempt of court by calling the supreme court judge a crackpot judge.. his judgement reflects the facts of the case, not the desires of a prejudiced mind sitting in television studio. I strongly believe she should be charged for her irresponsible utterances. 1. They are completed Anti Modi and will do anything to make sure they he does not become the PM. 2. They are bothered only about their TRP's and since AAP is getting them the TRP now they will be running it for some time. I have completely stopped watching MSM tv channels and mainly depend on Social Media for my daily dose of news ..
NaMo's answer to Rajdeep in 2007 as shown in 3.42 min video is really one of the many bests. Wow!! And remember that Nidhi Rajadan of NDTV who said "We even question Supreme Court" to some gentleman in US whose name I forgot, who was backing NaMo. Another instant in this Gay judgment, I remember someone asked Kapil Sibal that this particular judge who has delivered this judgment on Gays, has also delivered the judgments on 2G and Coal scam.The person who asked the question was not visible. Kapil Sibal evaded straight answer to it. But the point to be noted here is that particular beat reporter is following what their bosses like Scumbag and Scumbagini are telling them with the above mentioned tweets. Similarly, in Arushi case all the News Channels took sides and were discussing it as if they are the judges. The agenda is clear demolish democratic institutions, in the name of democracy. small correction,the gentlemen is from UK and his name is BarryGardiner. Fatastic.. Nice observations.. Though people want to get over 2002 , they guys doesn't allow them to forget..Guys like CNN_IBN, NDTV is a Cancer which is growing in Media. Perfect Chamaat (as they say in Mumbai)..
"it is okay to abuse in English but the same thing wouldn’t pass if it were in a local Indian language"
Haha similar observation I have seen among girls who never use abusive words in their vernacular language but liberally use sh*t and f* words and dont see anything wrong in that. 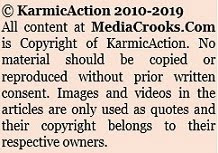 The articles on this MC blogs, in recent times have lacked the focus that it was once known for.There are enough matters to highlight, but as the frequency of the articles have increased, the quality has suffered.Would do well to introspect. How you narrate such issues so authentically! It would be wrong to say that these media crooks just hate Modi or Hindutva. They hate India. Their whole aspiration is basically to live in a Western country and since no Western country will take these coolies they want turn turn India into a Western country where they can live as their Western gods in their Western paradise. The thing that stands in their way is Indians native non-Western civilization known as Hinduism. Sinve Modi, BJP, RSS etc. are champions of Hinduism that is India's native civilizational identity and ethos they want to eliminate them. But their real target for termination is India. Kejriwal is cut from the same cloth. His AAP is congress minus the gandhis. Ideologically they are both indistinguishable. Both Congree and AAP are basically parties subscribing to anti-development socialism and anti-nationalist secularism. They are birds of a feather. Agree. It's overwhelming when one thinks about how much sway these animals have in India and how long they have been getting away with it. It's to the eternal shame of Hindus that they have allowed this. If change is not enforced in 2014 and kept there, then one would be close to losing hope altogether. In one of the TV interviews, it was funny seeing Rajeev Gowda squirming and taking a stand that "Shehzada" has communal overtones. The extent to which these Congie spokies go to defend the indefensible - equating their vitriol with "well within limits of decency" addresses by NaMo. I like Arnab's encounter with Meenakshi Lekhi, when he tries to bully her by saying-"Never ever, ever ever, ever never dare to talk to me like that". when was this? Do you have a video link? The video clarity is not good, but you can make sense of whats going on. Kudos to Meenakshi for standing her ground. I wonder what would happen to these journalists once BJP comes to power. I guess they will meekly surrender to the powers to be. It is always refreshing to read your comments on MSM. However, I am a bit suprised that His Majesty Arnab Goswami has not found a place here. The way Arnab conducts his Newshour is absolutely outrageous. It seems more like prosecution rather than discussion. It seems Arnab is a megalomaniac person and enjoys some sort of sadistic pleasure in constantly interjecting when a panelist speaks, diverting from the main topic, thunder down any rational voice, take out half or even quarter of a sentence and make out a crooked meaning and sometimes even insulting the guests. A few days ago, he invited a Christian priest to speak on 377, and was pilloring the poor fellow without allowing him a chance to explain his stand. This way the Newshour sessions quickly degenerates into total mud-slinging and cacophony and no meaningful discourse can take place. In fact, Arnab looks like more of a jail warden rather than a newschannel host. I look forward to your tribute to this priceless piece of MSM bully in your future columns. Watching the 2007 HT summit where Rajedeep's smiling when Modi takes him head on for trying to hijack the agenda, it seems like after all these media crooks are like Shakuni... they are perhaps only pretending to support Congress while actually helping Modi win..? Your comment has been deleted because you quote a person who has abused this blog in the past with mindless nonsense. Secondly, the person you quoted does not allow free speech or free comments on his own blog. Therefore, I have decided not to allow comments or quotes from cowards who hide behind "moderation" on their sites but comment on others sites. Of course, this has nothing to do with you. Its a decision I have made.. The moment a new government comes to power in 2014, one entire floor of a five-star Delhi hotel, occupied by enigmatic foreigners, may be raided, although it is more than likely that it will be vacated before the election results are announced. These foreigners are local controllers of a number of North Atlantic Treaty Organization countries, straining to prevent Narendra Modi from ejecting their Indian nominees from political power in Delhi. There are good reasons to believe that they were involved in the attempt to assassinate Narendra Modi at the recent Bihar rally, because these countries retain intimate ties with jihadi groups worldwide. This is known from their role in facilitating terrorist outrages in Chechnya and from the presence of Pakistani Taliban trainers in Syria, who are assisting the North Atlantic Treaty Organization to overthrow president Bashar al-Assad. Ouch!!! That must have surely hurt...for Numero Uno! Any idea if he reads your posts? By the way, yesterday's debate on CNN IBN anchored by Bhupender Chaubey had Nikhil Wagle accusing BJP of creating a rift between Anna and Kejriwal. He was so worked up and vociferous that Sudhanshu Mittal of the BJP actually wondered aloud whether Wagle had joined the AAP! Another person who is openly supporting the AAP these days is Arnab Goswami. Yesterday, he sounded so so upset that the rift between Anna and Kejriwal is only helping Congress and BJP and was chiding the representatives of the 2 factions for this. Arre baba, if they are fighting with each other and this is helping some other party, whats' Arnab's problem? Its their funeral, isnt it? As day of their reckoning draws near, they are bound to become shriller by the day.2002 riots have been described as Pogrom,Genocide ,Mass murder, Massacre and what not.What is not stated is the number of people who have made living out of these riots.Refer to the case filed by residents of Gulberg society against one such "beneficiary" - Teesta Setalwad. Abusing Modi,RSS,BJP,VHP and Hindus in general has become the stock in trade of these tribe. "Media Crooks" should publish TRPs of these worthies on a normal day. In a way I am happy that these rats have abandoned sinking ship of Congress. Fortunately, going against Narendra Modi, they are climbing a small boat which barely crossed a small stream (behind BJP). This in longer run (next six months) will help Mr. Modi. To address these rats, Congress recently announced (pleaded) that they should not write Congress off. Your article "Miracle at Gandhi Maidan" was the first article I read. Let me acknowledge you that you have been gifted with exceptional quality of thought which analyses the so called "news" on televisioon and newsprint and presents us with facts only with their true interpretations. As most of the readers have opined, this is an outstanding article. The video about the Rajdeep-Modi spat inn 2007 was really heart warming.